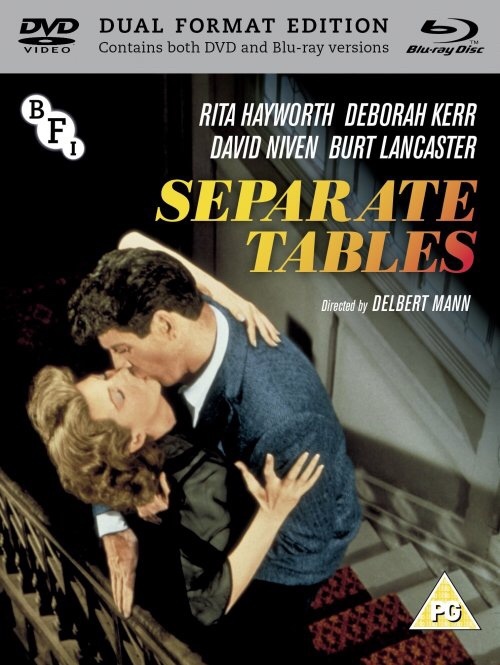 Delbert Mann's 1958 classic MGM drama Separate Tables, based on a Terence Rattigan play and co-scripted by Rattigan himself, is a star-studded character study of a group of residents at a small British seaside town. Lovely but vulnerable Anne Shankland (Rita Hayworth) travels to the hotel in hopes of starting over with her ex-husband, John (Burt Lancaster), but she does not know that he is already engaged to Pat Cooper (Wendy Hillier), the manager of the hotel. Meanwhile, Mrs Railton-bell (Deborah Kerr) discovers the hidden truth about war veteran Major Pollack (David Niven). Considered daring in its day due to its frank discussions of sexual topics, Separate Tables was nominated for seven Academy Awards, and won for Best Actor (David Niven) and Best Supporting Actress (Wendy Hillier). There are a couple of mistakes in the synopsis: Mrs Railton-Bell is played by Gladys Cooper - it's her decidedly unmarried daughter Sibyl who's played by Deborah Kerr. And it's Wendy Hiller, not Hillier. This classic MGM drama from 1958, based on a Terence Rattigan play and co-scripted by Rattigan himself, is a star-studded character study of a group of eccentric residents of a Bournemouth boarding house who all share a common trait – loneliness. On 20 August 2018 the BFI brings the film to Blu-ray for the first time in the UK, releasing it in a Dual Format Edition with extras including an audio commentary by Delbert Mann and a Guardian Interview with Burt Lancaster. Major Pollack (David Niven) hides a dark secret behind a polished military career; Sibyl Railton-Bell (Deborah Kerr) is a shy neurotic who lacks the courage to break away from her domineering mother; John Malcolm (Burt Lancaster) is a disenchanted writer who hides his bitterness in a pool of alcohol; and Ann Shankland (Rita Hayworth) is an ageing model whose narcissism masks her deep fear of growing old alone. In one emotional evening, these four unhappy misfits will bare their innermost secrets and change each other’s lives forever. Considered daring in its day due to its frank discussions of sexual topics, Separate Tables was nominated for seven Academy Awards, and won Best Actor (David Niven) and Best Supporting Actress (Wendy Hiller).